We shall be sharing with you samples and instruments that we think you might find useful, or give you that extra inspiration. They will be available to download here for FREE, so keep checking back for updates! The YAMAHA CS1x is a digital synthesizer that emulates analogue sounds and controls. It does have some cool sounds, and we will be made available here as samples or instruments. First off is an always useful electronic kit as an Ableton Sampler instrument. Download the ZIP, it’s an Ableton Project so will be ready to play with straight away. Enjoy! 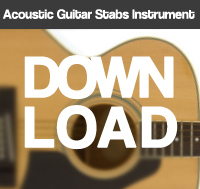 This acoustic guitar sampler instrument was recorded using an SE2200A microphone. It covers major and minor chords from A to G. Download the ZIP, the file is and Ableton Set with the sampler instrument loaded and a test clip. Enjoy! This is the second YAMAHA CS1x synthesizer sampler instrument for Ableton. This time it’s a Rhodes style keyboard sound, hope you enjoy using it. Download the ZIP, it’s an Ableton Project so will be ready to play with straight away. Enjoy!